Tooth wear is caused by everything from acidic foods and harsh brushing, to grinding your teeth and even biting your nails. While enamel is the hardest substance found in the human body, our teeth are subjected to continual abuse, and it is normal to see deterioration over time. 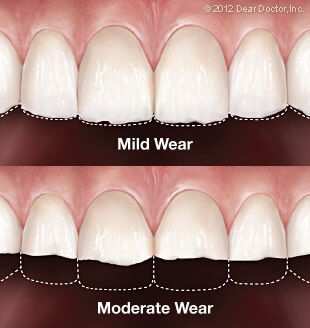 Tooth wear can be categorized by the different causes, including abfraction, abrasion, attrition, and erosion. Abfraction is when there is enamel wear right at the gum line, or the cementoenamel junction, where enamel and cementum (a calcified substance which covers the root of the tooth) meet. Abrasion is when enamel is chipped away little by little due to rubbing or scraping, such as when people brush their teeth harshly with either too much force and pressure, or hard bristles. Things like frequent and improper toothpick use, and even retainers or dentures, can also cause abrasion. Attrition is when enamel is damaged because of direct contact between teeth. Those who grind their teeth, whether or not they realize they do, often suffer this problem. Finally, erosion specifically references enamel wear that is the result of chemical reactions. Certain acidic juices and sodas may have this damaging effect on teeth. Once the damage is done, there is no way to reverse it. Enamel, while very durable and tough, cannot repair itself because it is not able to generate new material. However, it can remineralize, which means that it possesses the ability to regain minerals and slow the process of corrosion, if you take care of your teeth. Nevertheless, even with proper oral hygiene and good nutrition, age plus everyday wear and tear will slowly break down the structure of anyone’s pearly whites. In serious cases, enamel can be worn to the point where dentin, the sensitive part of the tooth, is exposed. Teeth damaged by enamel loss can cause many problems for a person’s smile. There could be bite alignment issues that result, cosmetic negatives, or the overall strength of the affected teeth may lessen. Dental Professionals of Lincoln Park Once you know the cause, we can teach you how to eliminate or decrease its affect on your teeth. Our cosmetic dental procedures can also restore your smile to its youthful radiance and diminish the appearance of wear.